More than 5000 Australian Fijians yesterday gave Prime Minister Voreqe Bainimarama a rousing welcome in Liverpool, New South Wales. He was cheered and applauded as he addressed them during the Fiji Day celebrations which completely overshadowed an anti-Government protest by less than 20 people led by activist Oni Kirwan. Many people interviewed were not even aware there was a protest. It happened at an obscure part of Bull Dog Park, well away from the centre of activities. The welcome was the same if not bigger than last year’s reception when he visited Sydney before the general election in September. 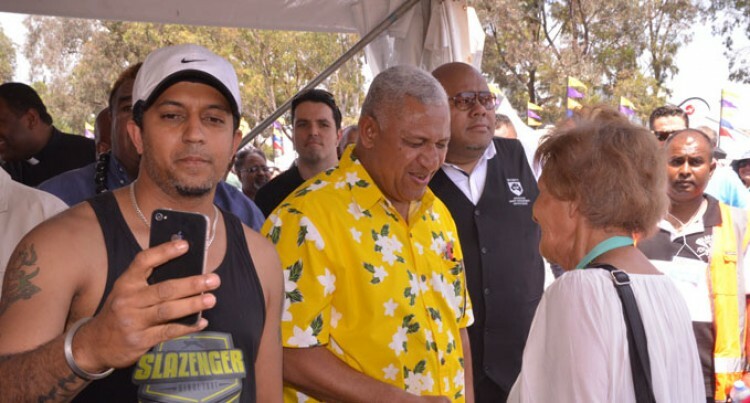 Mr Bainimarama looked relaxed in a yellow floral Bula shirt and grey sulu when he arrived with wife Mary who wore matching fellow yellow jaba and sulu. They were accorded the full traditional iTaukei welcome ceremony. Mr Bainimarama’s support continues to grow after one year in office. Many Australian Fijians yesterday spoke strongly of their support for him. Taniela Lotu and Talatala Radredre from Nadroga said they had prayed and continued to pray for a better Fiji. Lawrence Prasad, a security officer originally from Suva residing in Campbelltown, said he was very happy with the progress Fiji had made. He said he was impressed with what he saw when he went to Fiji with his family for a holiday in May. Taina Ravasea from Gau and Carol Smith residing in Glenfield NSW, said they had always supported Mr Bainimarama because his policies appealed to them. Mr Bainimarama drew the loudest cheer when he apologised to those affected by the 1987 and 2000 coups. He said a majority had left their homes and families to escape the injustices. He invited them to return to Fiji and invest in the country.